So Peter set out with the other disciple to go to the tomb. They ran together, but the other disciple, running faster than Peter, reached the tomb first; he bent down and saw the linen cloths lying on the ground, but did not go in. Simon Peter who was following now came up, went right into the tomb, saw the linen cloths on the ground, and also the cloth that had been over his head; this was not with the linen cloths but rolled up in a place by itself. 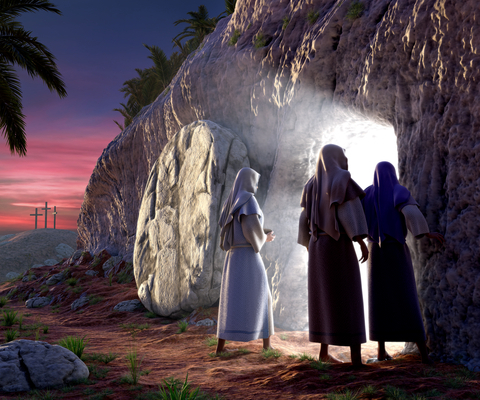 Then the other disciple who had reached the tomb first also went in; he saw and he believed. Till this moment they had failed to understand the teaching of scripture, that he must rise from the dead. The reason for the joy of Easter is that Christ is risen – the women who came to the tomb found their joy in this resurrection. They found joy also in a beautiful dawn in the garden, or in their friendships but the joy of Easter is a joy of faith, which nothing need take away. This is why the title of the Pope’s message to the church last year, is ‘The Joy of the Gospel’. He says that a Christian must never look like someone who has just come back from a funeral! The tone of Easter is joy in the refrain – we are an Easter people, and Alleluia is our song. The joy of the resurrection is a joy in giving the life we have got from God: “Life grows by being given away, and it weakens in isolation and comfort. Indeed, those who enjoy life most are those who leave security on the shore and become excited by the mission of communicating life to others” (Pope Francis). The Alleluia is for singing, not for humming; it is to be heard from the voice of the heart and lift the hearts of those we meet, live among, live with and pray for. We often see great joy in the middle of huge poverty: often the poor can live for the present moment and enjoy it to the full. This doesn’t mean all of life is content and happy if we are poor, but a door opens in our need for the risen Christ to enter our lives and reach others though our lives. Let’s not be like Christians ‘whose lives seem like Lent without Easter’ (Pope Francis). Having lived through the joyful season of Lent, our hearts are wholly lifted now in joy received and joy given. Risen Christ, raise our lives in joy. This entry was posted in Gospel of John, Gospel Reflection, Liturgy Resources, Prayer Resources, Scripture and tagged Alleluia, Donal Neary SJ, Easter Sunday Year A, Gospel Reflection, Gospel Reflection for Easter Sunday Year A, Jesus, John 20:1-9, Joy, Joy in Giving, Pope Francis, Resurrection, Sunday Gospel and Reflection for 20th April 2014, The Joy of the Gospel.